There can only be one winner. Everybody wants to own one of these bad boys. Who wouldn’t want to brag that their external hard disk is waterproof, fireproof and shockproof (maybe even bulletproof)? But sadly, we can only choose one winner. An email has been sent to you. Please reply within 24 hours. Failure to respond forfeits your prize and in that event, we’ll choose a new winner. For those who didn’t win, please don’t give up trying. We’ll have more of these giveaways in the future. In the meantime, why don’t you take advantage of the deal Costco is having right now — get a 2TB ioSafe Solo for $249.99, which is $150 off the recommended retail price. 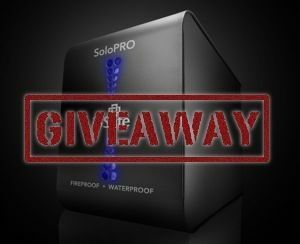 MakeUseOf would like to thank ioSafe for their generosity while participating in this giveaway. Interesting in sponsoring? We’d love to hear from you. Get in touch with us via email. I wish you won't respond. Naaah...just kiddin'. Congrats dude! As usual .. lost this time too.